After trying to find a way to run XBMC fullscreen in second monitor I decided a bespoke solution was the way forward. UPDATE: This post was written back in the times of Ubuntu 12 (I think). As such as as you can see from the comments at the bottom of the post there are now better ways of accomplishing this task. Although this tutorial focuses on the XBMC Media Center it can be applied to many other programs. 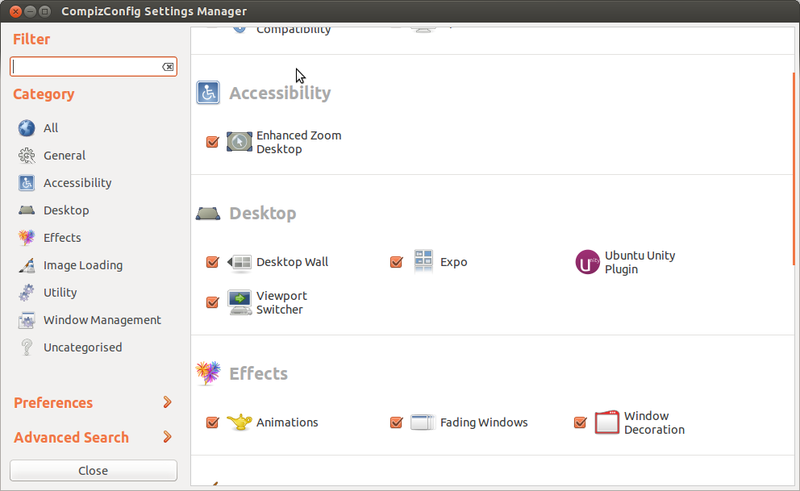 I know there have been work-arounds for previous versions of Ubuntu but over the years they have fallen by the wayside. What I’m going to show you now will allow you to run XBMC fullscreen in second monitor. Run XBMC up so that we can find the title it uses. into the terminal. This will bring up a list of windows that the window controller is in charge of. The chances are that the XBMC window is called “XBMC Media Center” but it may be different on yours so look in the last column of the output and copy the XBMC title. Now find the field titled “Decoration windows” and click on the green plus icon on the right hand side. Once that box disappears you can exit that program. The display name is straight forward – take a note of this. 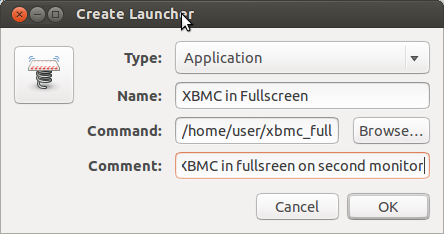 Now you need to change the NAME variable to something other than the default value **IF** your version of XBMC has a different title in the window (see last step). You also need to change the DEVICE variable to the one returned as Display Name above. Lastly you need to change the PRIMARYWIDTH variable to the third number in the returned Display Sizes above. Now we need to save the file and make it executable. This will bring up a box that will enable us to add a shortcut to the desktop. We can then drag and drop it on the launcher. If you want to type any comments in the last box then feel free. Take a look on your Desktop and you should now have a shortcut to XBMC that works as default in full screen. If you want, simply drag this shortcut over the launcher to the side of the screen. That about does it for this script. That’s it, thanks for looking, I hope you enjoyed the post and don’t forget to leave your comments below. At some point further down the line the above script stopped working for me. It appears as if it needed a bit of a timeout so I often had to run a script containing these commands. This basically goes through the previous proceedure but as the XBMC program is already running it just sets the GUI co-ords etc. If you have run the first part of the post but XBMC is still in your primary monitor then try this part. Hopefully your system just needed a bit of a timeout before the wmctrl commands were set. Sorry to take so long to reply. Unfortunately I haven’t used Windows in years and so I have no idea how you would accomplish this. Hopefully you manage to solve the Windows issue. It works perfectly when I place my second monitor on the right.. but not on the left.. Does that make any difference? If not I’ll look into it further. Are you still suffering with this problem? I’m about to post an update the the original post with the problem that I encountered further down the line. This may help you. I followed this, thanks I learned a few things! However it starts on my main monitor. I have an off setup where my second screen is above and half way to the right of the main. I used 881 as my third number, and tried 0. Both came out the same. Any idea how to fix this. I’ve been trying to get separate xscreens working but cant find a good guide. Is this something that is still bothering you or have you solved it? I’m about to post an update to my original post that may help. Just want to say I followed your tutorial and it works an absolute treat! If I run the script via terminal it sets the application to fullscreen on my TV and I can’t believe it! What a fine piece of work you’ve done there, I can’t thank you enough! No more grey bars on my TV, you have made my day! WOW! Thank you so much. That is a great compliment and much appreciated. There are people who cannot get this script to work, not through any fault of there own but it just doesn’t suit some systems. Even I have had to apply a subsequent script that applies a timeout before going full screen. Again: thank you for the brilliant feedback. I’m on Linux mint 17. This seems to work for me but the audio stays on my computer speakers, no matter the setting I use in system/audo output in xbmc. Do you have any idea how to shift it to the TV speakers? I’m afraid I cannot help you with that. It took a bit of work to get to the point of this post but as for sound I am not able to comment on that. Care to update for the change to Kodi? Sorry but I haven’t used XBMC for a while now but when I do I’ll have a look at it and see what I can do. Many thanks for leaving a comment though. It’s much appreciated. I will now be updating this post over the next few weeks to a month. I hope you found a solution though. I wasnt paying attention & leaned on my mini keyboard and my XBMC screen has minimized. How do I maximize it? Hi, Thanks for the tips. Question: Is this still the best way to go, as of this date? I ask only because there have been updates to both the OS and XBMC since. I am not too sure to be honest. It seems from playing about the other day that the latest update to Unity has ruined this post. The Window Decoration window no longer works as it conflicts with the Unity plugin. That means that currently I cannot get the title bar to be removed. I am looking for alternatives but at the minute I have a massive personal project on the go as well which means that I only get the odd bit of time to look at this post and alternative solutions. I am running KODI on Xubuntu 14.10 with an extended dual screen setup. When running KODI in windowed mode on the second screen, I simply right-click the title bar of the KODI window and chose fullscreen mode. That’s it. Thanks, that helped. Old XMBC was not able to go full screen properly with two monitors attached. Works fine with Kodi. I do seriously need to update this post! It looks like this works “out of the box” with Kodi but as you rightly pointed out it usually works when working with old systems. Thanks for your comment and I’m glad it helped in some way. Thanks! !By the way the cssm stuff is not needed. Unity plugin is broken with that plugin(14.10) but it worked without adjusting that!!Thanks! !